J. Howard Case was born in May, 1852 in Pennsylvania. His parents came from England. His wife, Matilda, was originally from Iowa and her parents were from Norway. The couple married around 1888. Their eldest child, Pearl Case, was born in Minnesota, and their second (Robert E.) was born in the Dakotas. Sometimes between Robert’s birth in 1885 and 1890, the family moved to Washington, State.Bertrant Case was born in that state in 1892. Howard served as Town Marshal from 1902 to 1903 and again from 1908 to 1913. Much of the information during the periods 1902 to 1909 is yet to be uncovered, but from 1910 to 1913 the record is more clear. Issaquah at the time was primarily a logging and mining town. Nearby Monohon and the surrounding areas were also given to like industry. The 1910 census recorded Issaquah’s population as 628 (although this didn’t take into account nearly 200 people that lived on the outskirts of Issaquah proper.). North Bend’s population was 229, Snoqualmie, 279. 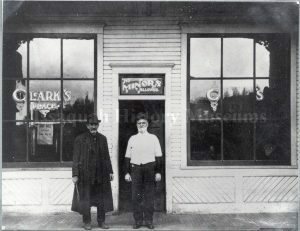 Issaquah had at least eight saloons going at any one time, and the ingestion of spirits, by a mainly male contingent from these towns, kept Howard busy. On June 30, 1910, one Fred Davis became so intoxicated that he lay down to sleep on the Northern Pacific tracks at the Bush Street siding. Unfortunately for him, a train came along and sent poor Fred to his maker. Marshal Case had the grisly duty of trying to identify the man and attempt notifying his next of kin. Another incident earlier in June, involved Dominick Geri age 22. It seems he stole a horse and rig belonging to a Mr. Whipple. He was seen the next day on the streets of town, and Marshal Case, “Extended to him a pressing invitation to enjoy his hospitality” (in the jail no doubt). Geri was taken before Judge Talmadge for a hearing and then was taken to the King County Jail as he could not post the $1,000 bail. A more serious incident occurred on September 23, 1910 that could have proved fatal for Howard. The Seattle-Tacoma Power Company had sent a non-union electrician to do some work in the Issaquah area. The power company had arranged for two Special Commission Deputy Sheriff’s to accompany the worker as a precaution. While drinking at the bar in the Bellevue Hotel, one of the Deputies by the name of William Pyncheon started a disturbance most likely due to his alcohol intake. Marshal Case was called, and when he arrived Pyncheon pulled out a gun. After a brief struggle, Pyncheon was disarmed and ended up in front of a judge where he pled guilty to a disorderly conduct charge. This so impressed the judge that he dismissed the additional charge of using obscene language on the street! Pyncheon was fined court costs and was released undoubtedly to explain his misconduct to his boss, the Sheriff of King County. Burglary seemed to be a problem then as it is today. On Mar 18, 1911, the J. J. Lewis Hardware Store was broken into by breaking the glass paneled front door. Three revolvers and a small amount of change were taken. The jail was not immune from break in or breakouts as well. On August 26, 1911, it was broken into and two young men locked away for disorderly conduct made a quick escape with the aid of their accomplices. An interesting note was that in November, 1910, the Town Council approved a pay raise for the Marshal to $60.00 per month. The news article doesn’t say what the salary was before the raise. The Mayor in 1910 was Frank Day; City Clerk was W.E. Holland; the Justice of the Peace was John Drylie; and Burnett Mullarkey was on the Town Council. Drylie also served as Marshal from 1906 to 1908 and Mullarky was Marshal from 1917 to 1920.